Hmmm, I bet you’ve never heard of it… well that’s the reason we love it so much, though we don’t want to be selfish, we want to share this love with you! What is the so called Athens Riviera? 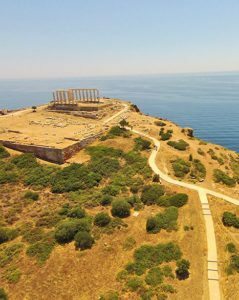 Most people would say that it is the coast line at the southern part of the city, starting from Pireaus port, up to Sounio (Temple of Poseidon). That it’s a unique treasure, it’s that deep blue of the sea, mixed with the sky blue and the amazing colors of the sun. It’s an amazing sailing experience, it’s a view of the city that not many have seen. It’s all that small little islands of the saronic gulf, the rare beauty of the Greek sea waters and the sun touching your eyes, the breeze twinkling your hair. It’s the children’s voices playing at the beach, the amazing beauty of the city and the sea from the Temple of Poseidon. It is your chance to let the sun and sea set you free! What a better start of the day than spending your morning at Vouliagmeni beach, a place of relaxation, rest and tranquility. Swim, sunbathe and enjoy an iced coffee or even better an ice cream. You can then enjoy your lunch around Vouliagmeni at one of the plenty taverns with a sea view. 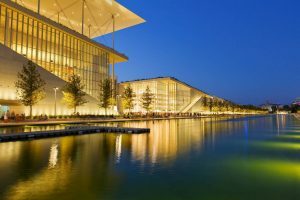 Rest a bit and then head to Stavros Niarchos Cultural Center, where each day they have different events organized. Don’t forget while you are there to enjoy the sunset, as well as the amazing view of the city and the Saronic from the terrace of the Opera building. You can end your day with dinner, cocktails and an evening walk around Flisvos marina. We surely hope that you will be visiting the Athens Riviera soon and we’d love to hear your thoughts and impressions!